A Painter´s Life on Planet Goodaboom: Ho Ho Ho. Christmas! , telling them to go and play outside! 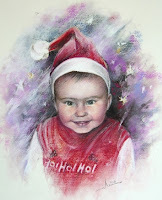 Christmas is normally a busy time for me as many people choose to give a child´s portrait as a gift. But well, to work hard once a year is not such a problem, is it? I wish a Merry Christmas to all of the children I painted for this Christmas, to their parents, grandparents or friends who had the fantastic idea to order their portraits from me! And of course I wish a Merry Christmas to each visitor of Goodaboom! 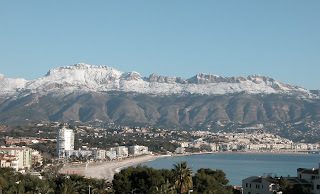 PS: No Street Gallery today, „el tiempo lo impide!“: it is blowing a gale on the beach and snowing on the mountains behind!